My recent week of potato salad and burger recipes mostly involved vegetable on the side of the burgers, not within. 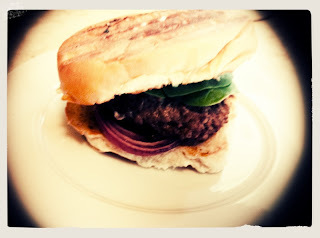 However, I wanted to try a few recipes that directly incorporated a vegetable into the actual hamburger itself. My mother used to make very delicious burgers that she incorporated veggies into, but I hadn't tried any similar recipes myself. I was pleased when a recent edition of Martha Stewart Living had a recipe for charred-eggplant and beef burgers that had eggplant in the actual burger meat. This recipe states that it takes 3 hours for total prep time. This includes a half hour of roasting the eggplant and 2 hours of draining; I did not follow these directions. The broiler on my oven is broken and our outside grill wasn't ready for grilling, so instead I cut the eggplant in half and grilled it on my George Foreman grill. This allowed me to not do the 2 hours of draining time required by roasting the eggplant whole. When sliced the eggplant grilled without retaining the moisture, so the additional step was unnecessary. Additionally, my oldest son ate all the dill pickles I had purchased for the sauce for this recipe, so I improvised with sweet pickles, adding more dijon and vinegar for balance. I love that this recipes incorporated the vegetable straight into the burger. My kids loved this burger, not knowing that there was a vegetable hidden within. My husband and I liked that the burger was nice and juicy thanks to the liquid from the eggplant. I would definitely make this recipe again with my modifications. For the recipe go to Martha Stewart Living Charred-Eggplant and Beef Burgers. this sounds really yummy!! Thanks for stopping by the S&R weekend hop again! Thanks for stopping by. I'm your newest follower now, too. I'm not really in coal country, either. I'm in North west central WV. That always makes me laugh when I say it. But, that's how locals describe it. I'm in Ritchie Cty. This sounds great. My hubby & kids love eggplant, and we usually have so many from the garden that I get tired of frying them! I'm stopping by from the Follow Me I Follow You Network at Blogaholic. I followed via GFC and Twitter, and subscribed via RSS feed. I would love to have you drop by my blog sometime! This sounds delicious, I love eggplant fixed any way!! @Klemaher I need to start growing more veggies! My family loves eggplant also. I just love eggplant! I also make a Great eggplant curry! Great Blog and I am very happy to follow you! Stopping by from the Monday Hop to say hello and follow. Join me tomorrow for Deal Seeking Tuesday! @ComfyMom, that's a good idea about making a bunch and freezing, especially since the produce at my local supermarket is hit or miss. Wish we had a better farmers market or I had more space for a garden!